Carefully chosen words will charm and entertain your customers. From websites and blogs to leaflets and newsletters, let us write them for you! Got an overlong work document that needs cutting down to size? We can be ruthless on your behalf. Get your own personal editor today! Great grammar and spelling are our passion - if you've made a mistake in your leaflet or book, we'll spot it. Proofreaders are always available. Our copywriting service is designed to help small businesses and organisations create engaging marketing campaigns and informative content. We work closely with our clients to make sure the end product is exactly what they are looking for. That means getting to know them, learning about their USPs and how the business works. We take the headache out of creating a presence online while you get on with running your business. Word Wizard can write web content, leaflets, longer brochures and even email campaigns. We’ll speak to you at length to make sure we understand your business, and look at your competitors too to make sure what we do makes you stand out from the crowd. You know your business best, from your clients to your USPs, but translating that knowledge clearly and concisely into a newsletter, blog or web page isn’t always easy. Our editing service for London and the South East is designed to help any kind of SME or sole trader add wit and sparkle to their communications. We’ll revamp your first draft until it’s perfect. Read more about our editing service. Spotting errors before they go to print is our forte! At Word Wizard we are trained to read your finished article, newsletter or blog with an eagle eye. We’ll help you eliminate spelling and grammatical errors, so that your clients receive slick, accurate communications that reflect well on your brand and business. 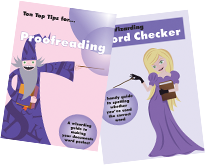 Read more about our Proofreading service. Contacting the media to tell them about your great new venture or event can be a daunting prospect. That’s why it’s essential to have all the important information a journalist might need in one handy sheet of A4 – we can write you a press release tailored to any media market of your choice, and provide advice on how to go about getting your event promoted. Read more about our Press Release service. Telling your life story is a fantastic idea – but writing notes, shaping chapters and determining who your audience is can make creating the book itself a difficult task. At Word Wizard we offer a ghostwriting service for anyone with a tale to tell. We’ll take your notes and interview you until all the information is in place, and then write it. We’ll work on it until you’re happy with the end result. Then all you have to do is commit it to an online e-reader service or find yourself a publisher! Read more about our Ghost Writing service. Word play: imputer or inputter?